We used a range of resources to deepen our understanding of one half. Water, sweets, chocolate, numicon and breakfast cereals were used with spaghetti to make our learning fun. Our trip to Kingston Lacy was phenomenal! We explored the beautiful gardens, looked at the orchard, bee hive, pigs and allotments as well as making bug huts, planting seeds and making leaf and flower prints. We worked on our throwing skills today by using javelins (foam rockets in disguise!). We have been learning about the tremendous work of bees through art and poetry. We even used shapes to make pictures: "Look, if I put these two bits together I make a hexagon like in the bee hives," said one child. "It has six sides." A letter from a giant prompted lots of team work as mums, dads and grandparents worked with their children to construct a castle using a range of materials. What an amazing afternoon with lots of team spirit, laughter and very proud children and families. We sat down with a cup of tea and looked through Learning Journeys afterwards; time for a well earned rest! We have been planting with gardener Mr Stone in our spiritual garden. We have been learning about how to feed the soil and what plants need to grow big and strong. A massive thank you Mr. Stone, we promise to water the plants and look forward to welcoming you again next week. Welcome to our summer term topic of 'Sun, Sea, Sand and Soil.' The medium term plan detailed above is subject to change depending on children's interests and responses to the topic. Individual target booklets will be sent out for your child in the first week of term detailing personal next steps. (These have now been sent out; pop in at any time to talk about them if you need to). Don't forget to regularly check the website to see what we have been up to! Life is always busy and fun in Ducklings Class! Thank you to the PTA for a wonderful Easter breakfast and Easter egg hunt. What a fabulous last day of term. Happy Easter everyone! We have had a go at African dancing! We used 'the Lighthouse Keeper's Picnic' as a stimulus for our science investigation. We used batteries, wires and lamps to make a simple circuit to help Mr. Grinling with his lighthouse. 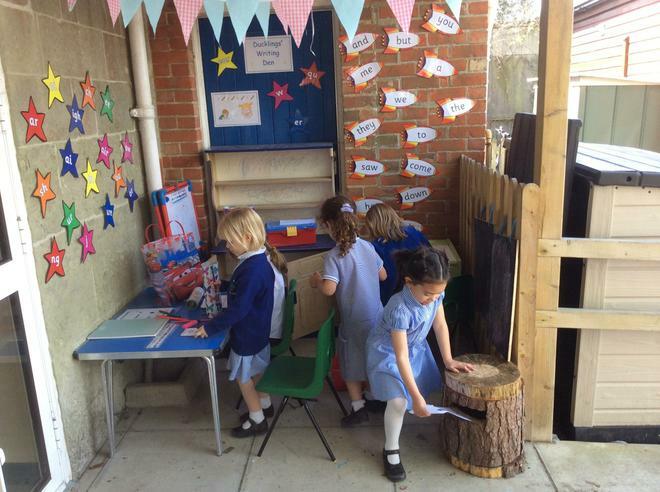 We also designed and wrote about healthy picnic lunches and built lighthouses using a range of resources. We celebrated World Book Day in many ways today. Aren't our costumes fabulous! We have been estimating and counting in ones and twos today. Using Handa's Surprise as a stimulus, we peeled, chopped and mixed fruit today to make a fruit salad before eating it all up. We enjoyed it so much that we wrote instructions to help us remember what to do. Can you make a chair for Baby Bear? We used a range of materials and shared our creations before discussing which material worked best and why. We engaged in a little role play today thinking about how other characters may be feeling. Who do you think we are? We carried out a blubber glove experiment to see how polar bears and penguins keep warm. We placed one hand straight into icy water and the other into a glove surrounded by fat. We quickly realised how good the blubber glove was at keeping us warm. We facetimed Mr Whittle in Australia this morning and spoke with him about his three week trek to the North Pole. He saw polar bears, arctic foxes, hares and wolves. He told us about eating reconstituted food, sleeping in a tent, building an igloo with inuits and how he fell into the water. A massive thank you Alistair! Can you build an igloo? Which material is best and why? We orally planned, carried out our activity and then evaluated. Here are some of our comments: "I am going to use sugar cubes because I can stack them like ice in an igloo." "The ice doesn't work; they're all different sizes. They're not like squares and can't stick together." " The marshmallows worked best; they were soft and sticky and I could stack them." What would you have used? After learning that ice melts in hot places we froze mummy, daddy and baby bear in ice gloves. We then thought about what might happen if we left one ice glove in the classroom and wrapped two others in newspaper and tinfoil. We predicted that "the wrapped up ones would melt quicker because it's hot in there." Look at our surprised faces when we realised that this was not the case. We have been using our senses in lots of different ways today. Who do these eyes belong to? What is hiding inside the gloves? What does the snow feel like? We made puppets and then worked in teams to retell a famous story. Listen to our voices. Can you name the story and the characters? What do you think of our fabulous weather poems? We used 'I wonder' statements to express our thoughts about 'The Umbrellas' by Renoir before using watercolours to make our very own umbrellas. Comments included: 'I wonder why they are in a group.' 'I wonder why they only have wooden toys.' 'I wonder why there is a lady with no umbrella.' 'I wonder what's in the basket.' Aren't we a thoughtful bunch. A huge thank you for all of the milk cartons. They have been put to good use over the Christmas period as we now have an igloo in class. This, along with new dressing up clothes and puppets has been used extensively! Welcome back to Ducklings and our new topic 'Whatever the Weather.' Please read our topic book and plans for this term online or alternatively wait for your own topic book that will be coming home shortly. Target booklets will also be sent home in book bags detailing your child's personal and specific next steps. Pop in at any time to discuss these. We look forward to another exciting term; watch this space to see what we have been up to! Wow! Santa visited Ducklings Class today. We sang him some songs and asked lots of questions about his reindeer. Thank you Santa...hope to see you soon! We sang and danced our socks off today for our Christmas production 'Born in a Barn.' Dressed as sheep and angels we not only contributed to KS1 songs but performed a song and routine on stage to our family and friends. A huge thank you to Mr Curtis and Mr Symonds for bringing in their Second World War jeeps for us to explore. Do you like our hats? We built our own jeep using large construction too. A whole morning of problem solving resulted in some super critical thinking and construction as we thought about what we could build to help the Gingerbread Man cross the river. "I made an underwater canoe; it chugs along and makes a noise. It has a piece of string to catch fish and the naughty fox." We're making ships with batteries 'cos' we want them to be remote control." "I've done a mountain so that he can climb to the other side; the fox won't chase 'cos' I've made a trap out of ropes and wood and plastic." After learning about the Christmas story and practising for our nativity, we have been leaving lots of notes and messages on our 'Come and Reflect' table. We looked for wildlife on our walk to Port Regis this morning and saw some very loud, low flying chinook helicopters. What a treat! We played with our new friends at Port Regis and made sandwiches, lighthouses and connected wires to batteries and bulbs in an attempt to make them light up; great problem solving! We listened attentively to a story and ate cookies too! We look forward to inviting them to learn with us again in Ducklings Class in the spring term. Our science experiment investigated if cars with big wheels travel further than cars with little wheels. We had some very interesting and thoughtful predictions: "The big wheels will make the car heavier." Another child thought little wheels would travel furthest: "My mum's little panda car has little wheels and that goes really fast so I think little wheels!" We used blocks to measure. What do you think we found out...? A massive thank you to our sculptor, Mrs Dawkins-White who spent the morning with us teaching us how to make clay boats. We made lots of sausages and coiled these around a base before adding a funnel and port holes. We then added some paint before they were whisked away to the kiln...we can't wait to see them! We baked, tasted and wrote about how delicious our bread rolls were. 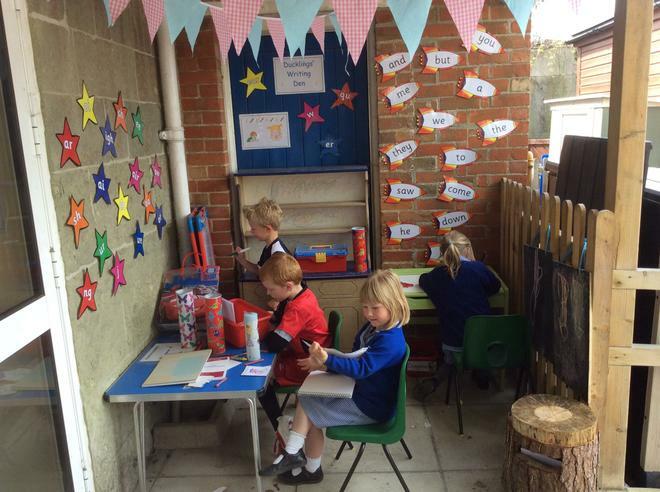 Our classroom smelt wonderful! Take a look at our writing too! 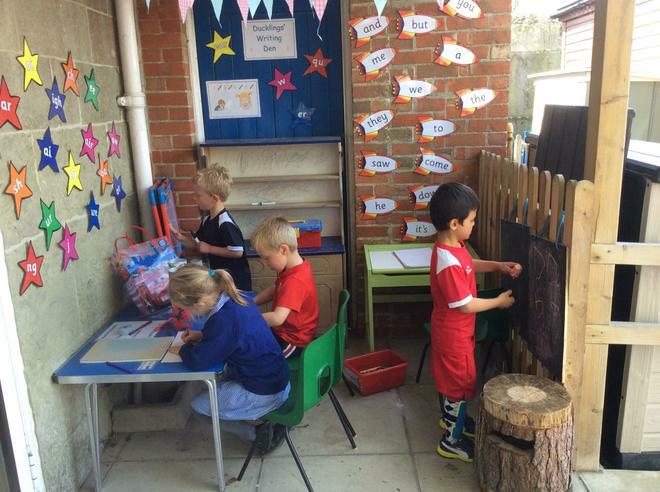 We have been learning about number, shape and pattern this term in both the indoor and outdoor classrooms using a wide range of resources. Look how smart we are! Wacky hair for Weldmar Hospice Care day! We raised £115 for this very worthy cause. Thank you! We went on a minibus today on our first ever school trip to Compton Abbas. We got to explore a range of planes, microlights and biplanes and even looked at the fire truck before learning about wind socks and eating biscuits in the cafe. A huge thank you to all of our wonderful helpers! We visited the Life Education Van today and Harold the giraffe helped us to learn about our bodies. We got to stick important organs on a body tunic and thought about the importance of sleep, whilst trying to reach for stars that were twinkling on the roof of the van. RAF Squadron Leader 'Strookie' taught us all about search and rescue and provoked lots of interesting questions. We watched a video, looked at pictures on the computer and rescued a teddy bear floating out to sea on a lilo! We had a phenomenal visit today from a 50 year old Jaguar. We got to sit in the front and back, put on the seat belts and 'drive' with our friends. We visited church today with our decorated pebbles and lit candles, said prayers and sang songs before placing the pebbles in our spiritual garden. Ducklings class is so much fun! We have been thinking about special people and animals in our family and why we love them so much. Take a look at our self portraits...aren't we a clever bunch! Today we got to learn and play with our new buddies! Our very first day at school was most exciting! We got to know each other better whilst exploring both the indoor and outdoor classrooms.